Water as a Frac Fluid? The first frac job consisted of pumping gelled oil (gelled gas-oline or Napalm actually), and many of the first frac jobs used viscous lease crude from fear of “damage”. Fairly quickly, cost considerations (safety not being a major issue at that time) drove a switch to water, so “Water Fracs” were born in the first years of hydraulic fracturing. Over time, advances in pumps, proppants, and fluids have made fracturing a more complex process, and the “more technically advanced” areas of the oil industry forgot about plain old water. 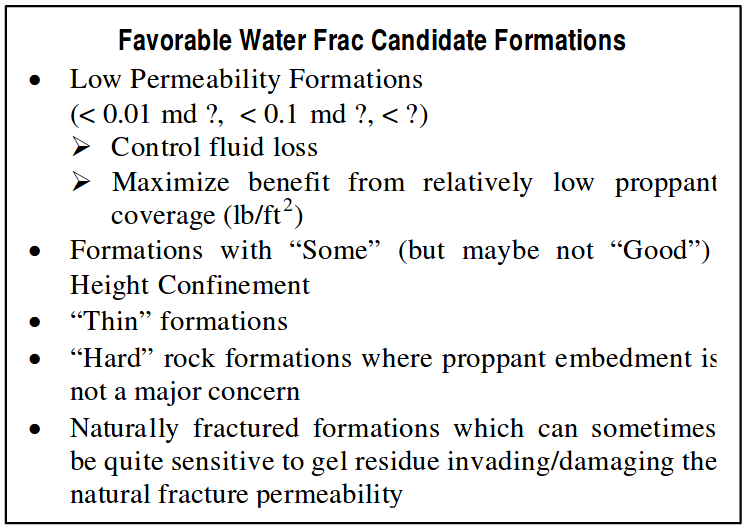 Thus, in these areas, the current standard fluids for fracturing normally pressured reservoirs are crosslinked gels (with breakers). Should we, Can we, go back? The Good’s & Bad’s of Crosslinked Gels? Crosslinked gels have excellent proppant transport properties and are relatively easy to mix. They are also very reliable through the use of normal QA/QC methods. 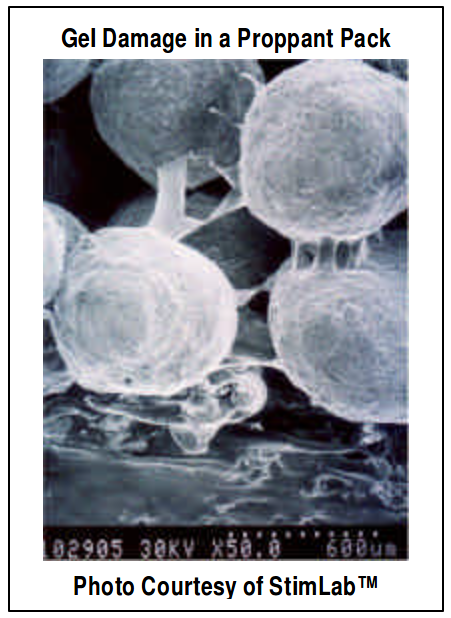 They control fluid loss in reservoirs very effectively. All-in-all they sound like pretty good fluids. However, they also do extensive damage to proppant pack conductivity. The damage results from the gels dehydrating and concentrating in the proppant pack (see photo). Engineers have learned to work around this problem by increasing the insitu proppant concentration to offset the effects of damage, and/or through the use of aggressive chemical breaker schedules. Another potential negative effect of crosslinked gels is the very high viscosity that can cause significant height growth, forcing use of a large volume of proppant to cover the productive and non-productive area of the fracture. This problem is especially noticeable in low permeability zones where length is needed for postfrac performance. 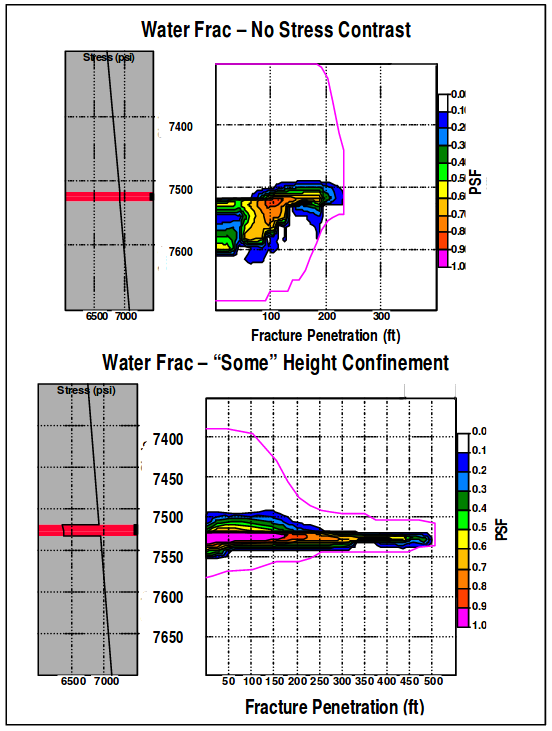 Fracture height growth is also a potential problem when there are depleted or water wet zones that a fracture should not intersect. An example of this is illustrated in the figure (above, to the right). In this case, a fairly large volume treatment (47,000 lb of proppant) has managed to create a propped fracture length of only about 125 feet in this thin zone due to height growth. In addition, gel damage to the proppant pack could make the effective fracture length even less than the propped length. Could Water Be a Good Fracture Fluid? An advantage is that water is a cheap, clean, non-damaging fluid (in reservoirs with no water sensitivity problems) that cleans up relatively quickly. The disadvantage of water is that it has poor proppant carrying characteristics, low viscosity, and no fluid loss control. Note, however, low viscosity may also minimize height growth and thus be a “+”. The low viscosity may also lead to narrow width, and thus could lead to bridging problems during a fracture treatment with higher proppant concentrations being placed in the fracture. But with sufficient rates, and for reservoirs with low fluid loss, water may still be an effective fluid. 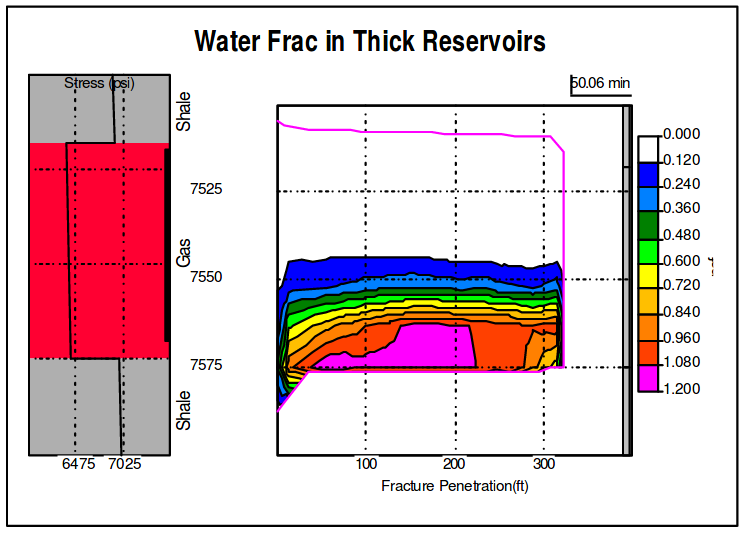 Using water as a fracturing fluid is intuitively best in reservoirs with low fluid loss (low permeability) and contained thin formations (maybe partially pressure depleted). Low permeability reservoirs can maximize the benefits of low proppant concentrations placed from the waterfrac because of the limiting water viscosity. The fracture can grow several hundred feet in length due to the low fluid loss, and keep the proppant targeted in the pay area because of the fracture containment provided. The results will be positive, provided net pressure does not exceed the containing stresses in the bounding formations. What kind of reservoirs would make poor candidate choices for a Water Frac? Again, this seems intuitive. 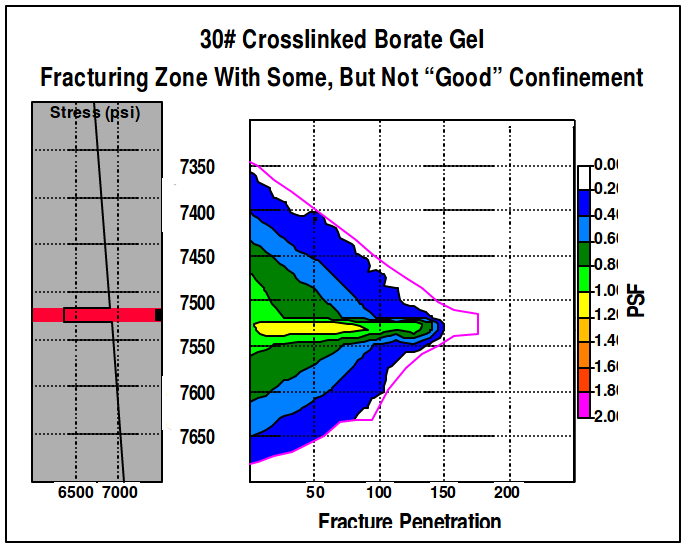 Reservoirs with NO height confinement would not be good candidates because the fracture would grow radially (just like with crosslink gel), only now proppant settles into the underlying shale due to low fluid viscosity. Length is difficult to attain because of the radial fracture growth, not allowing proper stimulation for a low permeability zone. only about 20,000 lb of proppant). With this relatively thin zone, with only about 500 psi of Ds (confining stress difference), a treatment using a viscous crosslinked gel would generate a nearly radial fracture as seen earlier. IReservoirs with thick pay sand are poor candidates because the proppant would tend to settle in the bottom of the pay and not effectively cover the pay sand. Although there could be some benefit to this fracture treatment, it definitely is not maximizing the potential for a fracture treatment. Also, high permeability reservoirs would be a poor choice because high insitu proppant coverage (lb/ft2) is needed for optimum production. Also, extremely high pump rates would be required to combat the high fluid loss, with the resulting horsepower costs, probably negating many of the benefits of the waterfrac. Water can be used as a fracturing fluid because of it characteristics as a clean, cheap nondamaging fluid. Care must be taken because of its adverse properties of poor proppant transport, low viscosity (bridging), and no fluid loss control. But with sufficient study and proper candidate selection, water is (still, after all these years) potentially a very useful fracture fluid.